Counting or measuring poverty is frequently meant to explain how poverty counts — how it affects people’s lives and the conditions in which they live. Anthropologists have contributed to the study of poverty, although often as a corollary rather than as a central objective of ethnographic research. Partly because of their disciplinary tradition of studying remote, exotic social groups and places, many anthropologists write of people and places that are, or appear, disadvantaged relative to larger, richer, more powerful societies (see, for example, Ferguson, 1999) As a discipline, anthropology aspires to holism — inquiry into ‘the study of man’ in its entirety. Within the sub-field of social-cultural anthropology, many researchers aim for an integrated understanding of economic, political, social and cultural practices and relationships within a particular social, spatial and/or cognitive locality, which may or may not be culturally or territorially bounded. 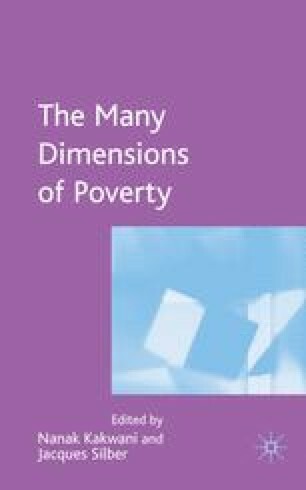 If poverty or ‘relative deprivation is… a multi-dimensional concept, embracing “all the spheres of life”’ (Lister, 2004: 22) then combining ethnographic insights with quantitative measures of poverty should enhance our understanding of its many dimensions.1 The present essay seeks to amplify and illustrate this point, using examples from ethnographic literature on Africa.